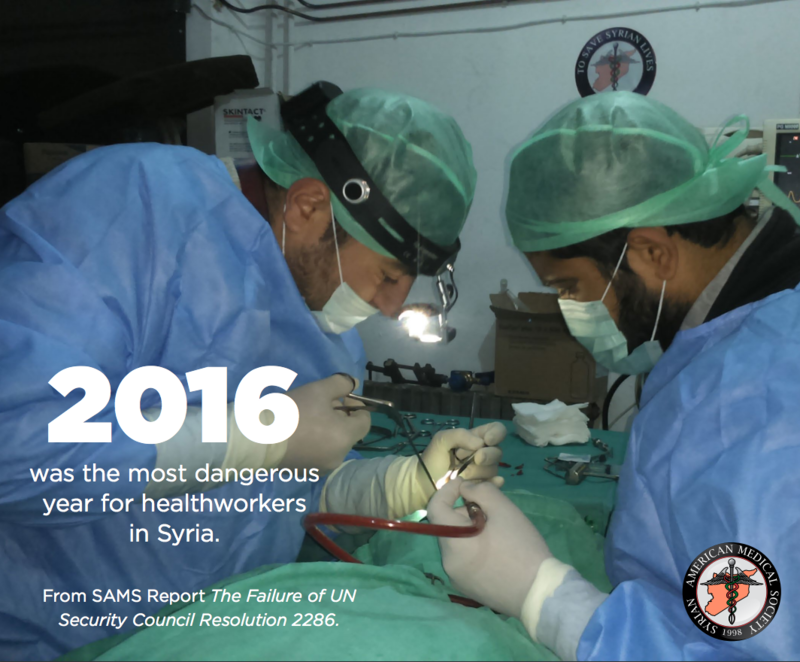 2016, particularly the latter half, was the most dangerous year for healthworkers in Syria. SAMS verified 168 attacks on medical facilities and personnel from June through December 2016. • Russia’s intervention in Syria, beginning in October 2015. Immediately following the Russian intervention, the rate of attacks on healthcare doubled, from one attack every four days to one attack every 29 hours. • The Syrian government’s offensive on Aleppo. 73 attacks occurred in besieged Aleppo—43 percent of the total attacks documented in the reporting period. • August was the worst month for medics in Syria, with 41 attacks documented. • 26 medical staff were injured and 80 were killed during the reporting period. • Unconventional weapons continue to be used to target civilian areas. From June through to December, there have been 9 instances of cluster munitions and seven cases of incendiary weapons being used against medical facilities. • 73 of the 168 attacks occurred in Aleppo City, 43 percent of the attacks in the reporting period. • While ceasefires continue to be violated, they remain the periods with the fewest amounts of documented attacks on medical facilities. • More investment in hospital fortification is needed, as the sheer amount of attacks and as well as the advanced and unconventional weaponry used have further strained healthcare capacity. SAMS’s two most fortified hospitals were bombed out of operation by bunker buster munitions. These weapons were used at least 4 times against medical facilities during the reporting period. • All forms of medical facilities and personnel were targeted, from trauma centers to children’s hospitals to ambulances.